Today, the Mobile App trend has successfully taken over the education sector. The Mobile App Development Company offers a diverse range of software that allows to peruse the top eLearning app. Considering the exact requirement of both students and the owner of the app, some of the education apps are tailored to match the unique requirement in the most ideal way. As we understand, education is not just the cornerstone but the foundation on which the whole civilization is based out. The education system also requires updates and transformation in the context of mobile app development. The app offers free online courses, comprising hundreds of different topics to choose from. The best part the app is - user can even pay for a nano degree service that takes feedback from specialists, coaching, and a verified certification for $200. A nano degree - comes as a great choice for those looking to get a career in programming. The app is great and allows the opportunity to double the learning speed by using flashcards. Brainscape traverses the renewal of each concept perfectly, which helps in retaining knowledge more efficiently. It does not seek any charges to create, share, and find user-generated flashcards. Users can go for Pro subscription - $10 per month, $30 semiannually, or $36 per year. The lifetime subscription costs $80. Subscriptions proffer admittance to unlimited premium content, features like bookmarks, browse mode, card reversibility. Due is an excellent and robust alarm clock, that functions without an account or Internet connection. Due - set reusable countdown reminders and implement both daily and weekly reminders that benefit on nearly 60 alert tones. Furthermore, memos sync across the devices and automatically shift as you cross time zones. This app provides a series of test prep apps, like Ready4 SAT. It allows training to answer practice questions. It actually strives to educate the material and test-taking tips in mobile-friendly chunks, allowing the user to study whenever and wherever you have your smartphone. This app is not chargeable and even examines to match your potential SAT score with schools and academic programs around the world. In other words - it fills extra motivation to study. This apps makes kids excited to practice addition or multiplication. They are more enthusiastic about applying their math skills to run a mean cupcake business. It asks students to figure out the cost of each cupcake or orders, amount of Payback business loans and etc. Math Motion: Cupcake - offers fundamental -level math to life in a deceptive — yet exciting— package. Know the features that should be integrated into Educational apps to make it popular & smart choice! To have a successful strategy, you must add this feature - Live Tutorial - in the existing educational mobile apps. It's not necessary that people run after top education app, the live engagement attracts the students more ardently. For Instance; students need a sentient presence of a tutor to short-out doubts instantly. Hosting live tutorials is the best way for live interactions with the tutor and ask questions live and receive exact answers. Internet connection is not available 24/7 for all the students, thus giving offline mode accessibility will lead to increase the download. 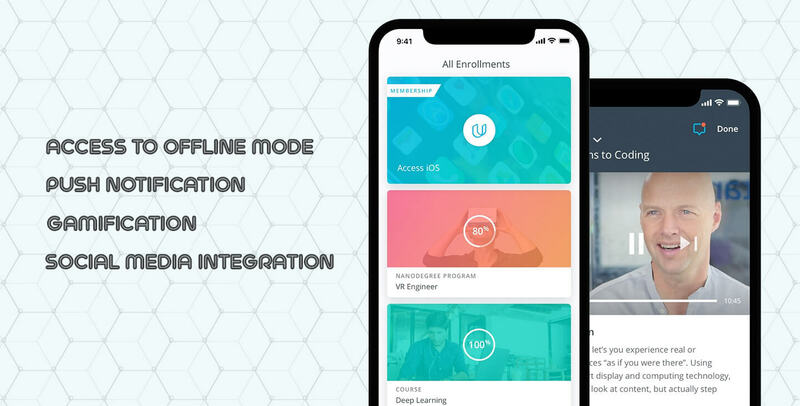 Further, a limited number of modules in one sitting can keep them interested in the app, this means students can avail app’s benefit without the internet. The number of the download and exact stats best show how successful the app is and, this information is crucial for course updates and app modification. Push notifications are becoming an essential part of almost every app, as this feature invites the user’s interest towards the app with frequent messages. Here, users get notified about the basic information in percentage about the course completed, or incoming tests, the number of tests finished, and interesting notes on running modules. It is very necessary to excite students to study and what else than the game can better make a student frank and comfortable. With an elearning mobile app integrated with games is a healthy way to engage students. Thus, it’s quite clear that gamification of your app is important to attract more users with a delightful experience. Now, gone are the days, when parents stopped their kids from using social media platforms. Today, the scenario has totally changed and social networking websites like Facebook and Twitter can be a positive factor in encouraging them to study. This feature has become a win-win situation the eLearning app agency Now, the Kids can use social media according to the score they get on the app’s mock test, and this also engages the students to study and earn the exciting reward. Education is industry vertical that will rapidly advance with the maturing time, hence if you owe an education business - you must step in the revolutionary education app development to walk parallel with the ongoing trend and facilitate the interest of the students. Hire a mobile app development company like Root Info Solutions that understands the requirement of the clients and leverage technology in the best way that benefits both the users and the owner.